This (fill in the blank) has been a cherished part of Alex's Christmas memories; IT's older than he is. We have inherited IT. But what is IT? Without naming names, one of us insists IT is a cute Christmas elf. The other is certain IT is a creepy gnome lawn ornament. The debate rages. Could you guys help us settle this once and for all? PLEASE vote: elf or gnome? Creepy or charming? That face is definitely what creepy nightmares are made of. gnome. and charming. at least when the wheelbarrow is in the picture - that helps make it! If the package came with it, I'd say it's an elf. If not, it's probably a lawn ornament. How big is it? P.S. Maybe that's what Florida elves look like??? Santa gnome, creepy in closeup. There is no question! It is an elf; just look at those beautiful blue eyes, the red hat and the white beard. I think the face has a gentle, mystic look about it. He has definetly been working in Santa's workshop. From a geezer who knows!! I don't think it's particularly attractive...but if it has good memories for Alex, DON'T ditch it! Gosh... All the "warm memories" we can keep from childhood are a good thing...even if they're attached to an....ummmmmm...strange looking object?? Creepy gnome. Don't ditch it - enter it into the Shelteriffic contest! The leaves between his feet say 'garden'. You don't find growing things like that at the North Pole! Place this cherished part of Alex's Christmas memories in a place of prominence on your Christmas evergreen, I say! We all have items that we inherit that may not appeal to others, but they have significance to us; this is one of his. Alex, I'm with you, man! Sorry, Jess, but I back him on this one. It's an elf with a...wheelbarrow bearing a present. Let me allay everyone's fears: we're keeping him for sure, creepy or not. But we're sick of arguing about whether the thing is an elf or gnome (I know, truly a matter of life and death.) So to settle it, we agreed we'd post him on the blog and accept the majority's verdict. (Alex even approved the photos to make sure our creature was presented in the most flattering way.) So thanks for your comments! And pinkmohair, GREAT IDEA! Except I just checked and the contest has expired. Bummer. I love Gnomes,and I think because of his style of hat and beard , he is one, but this guy does look creepy to me, like he's up to no good! I say banish him to the garden where the flowers will destract from the scary look on his face. My vote: Gnome, creepy. got to be a gnome...and i vote funny over creepy or charming. that face is hillarious. a keeper. 1. Definitely an elf. Can't decide on the creepy factor. 2. If it is older than Alex, then by golly it is an official family keepsake, which your kids someday may be fortunate enough to inherent. 3. If it comes with a gift every year... by all means keep it! It is indeed a gnome with some treasure he was entrusted to guard. (I did a little research this morning). 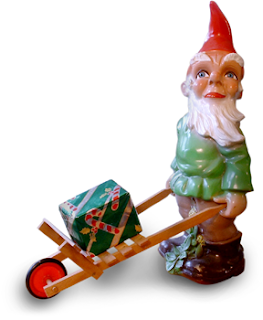 Even if he is a lawn ornament, gnomes should be allowed to celebrate Christmas,especially one as charming as this. This particular one appears to be of German origin, around the late 1960s. Probably has a rainbow in the box but you can't open it lest it escape. I vote gnome. I vote creepy if you're getting up in the middle of the night to get water and it startles you... or has moved from it's original place. Creepy gnome all the way. SCARY! Get rid of it Jess! it doesn't have pointy ears, it is a bonified garden creepy gnome!